SEIKO Prospex and LOWERCASE have been at it again! These are the new Solar Chronograph Diver's by Lowercase. 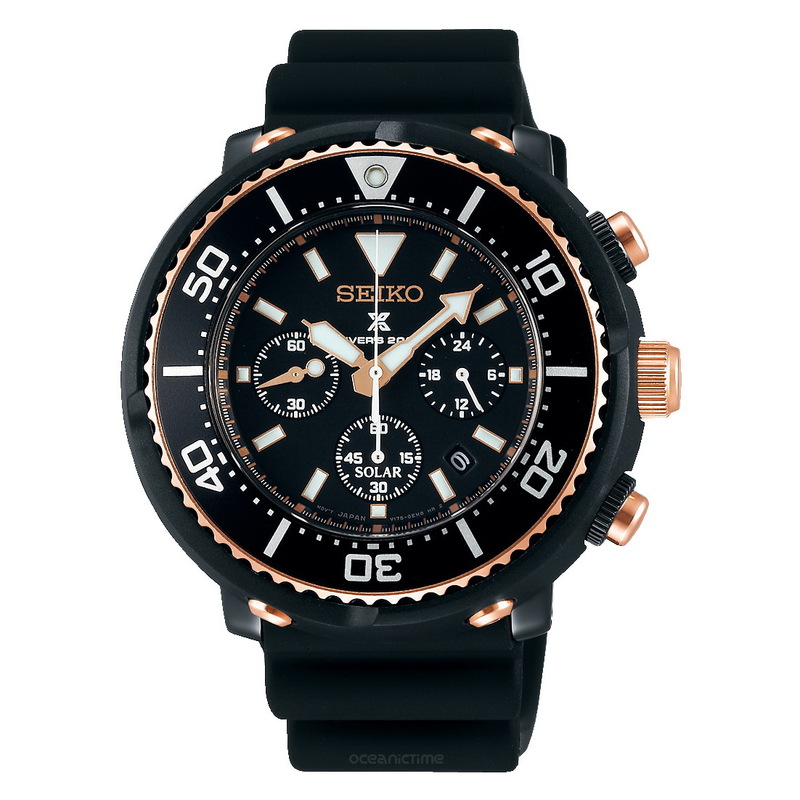 Produced in a 3000 piece Limited Edition for the SEIKO Prospex Scuba Diver collection, they are available in three versions: Ref. SBDL035, Ref. SBDL037 and Ref. SBDL038. Ref. SBDL036 is an unknown entity at this point but it could possibly turn up later as an all steel version with a steel bracelet or even a Pepsi version, who knows! It’s the first time I’ve seen a shrouded Tuna can diver as chronograph and if you check out Ref. SBDL035 (below), this is probably one of if not the only Tuna cans to come on a bracelet. The Solar Chronograph Diver's collection features a Stainless Steel inner case with a plastic outer shroud. The design dates back to 1975 when the legendary Professional 600M model was released. Ref. 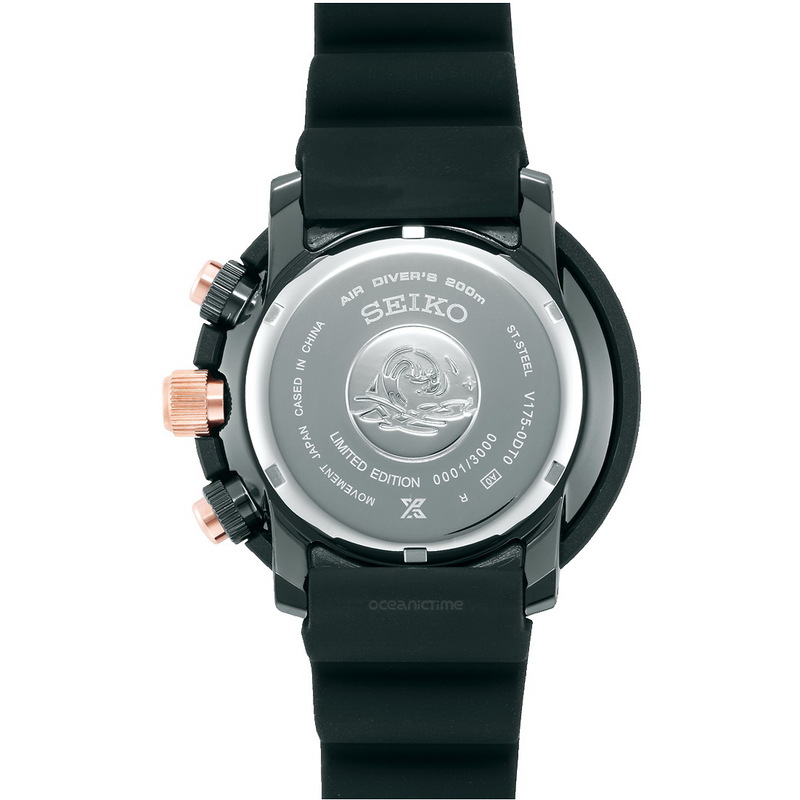 SBDL037 has a Stainless steel finish while Ref. SBDL035 and Ref. SBDL038 are in Stainless steel with a black coating (not sure what it is). In addition to black Ref. SBDL038 also has some gold elements. Divers features include: a domed crystal, a screw-down crown and caseback, magnetic-resistance, a unidirectional rotational divers bezel and a water-resistance to 200 meters. Each caseback has been individually engraved with its serial number. 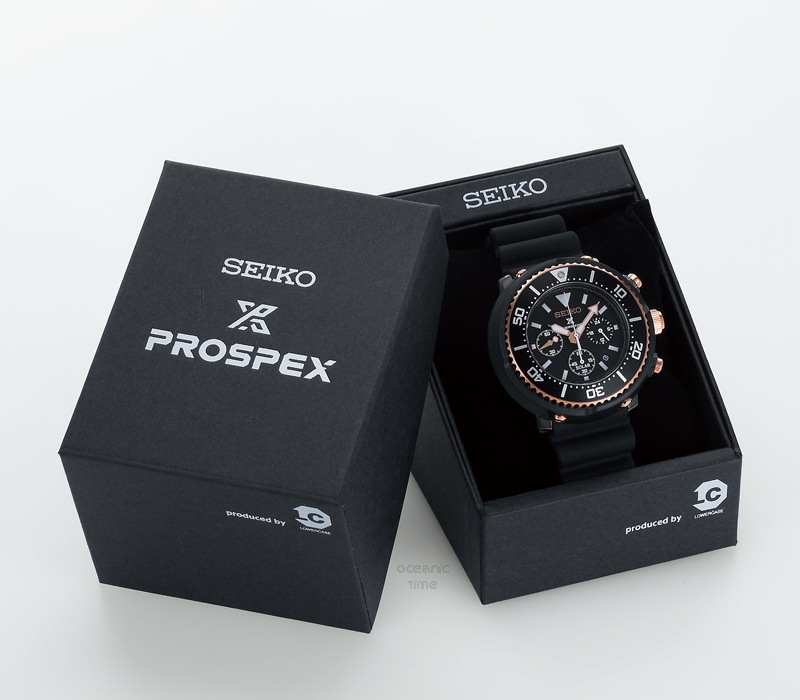 These are Solar powered watches so they are fitted with Seiko's Solar Caliber V175 which has an accuracy of ±15 seconds per month and can operate for 6 months when fully charged. Its functions include: an overcharge prevention function, a 24-hour hand and a chronograph up to 1 hour in 1/5 second increments. The dial is with Seiko LumiBrite applied hands and indexes. 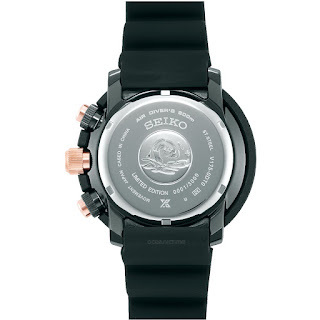 The new SEIKO Prospex Solar Chronograph Diver x Lowercase comes on a rubber divers strap. Ref. SBDL035 has a black coated Stainless steel bracelet with a double-locking divers clasp with push button release. Prices are as follows: Ref. SBDL035 is 63,000JPY while Ref. SBDL037 is 50,000JPY and Ref. SBDL038 is priced at 55,000JPY. All I can say is WOW! Love the design and the Seiko solar mechanism has been out for a few years and tried and true.